chairman, for his continuous encouragement and support. and Roger M. Thompson of Linguistics. Anas, Dian, Maggie, Mahasen, Manolo, and Molly. me to pursue this degree. developed by F.R. Palmer in Modality and the English Modals. dynamic, epistemic, instructional, and nonfactivity. and preparing materials for EST are discussed. engineering, and medicine at the University of Florida. 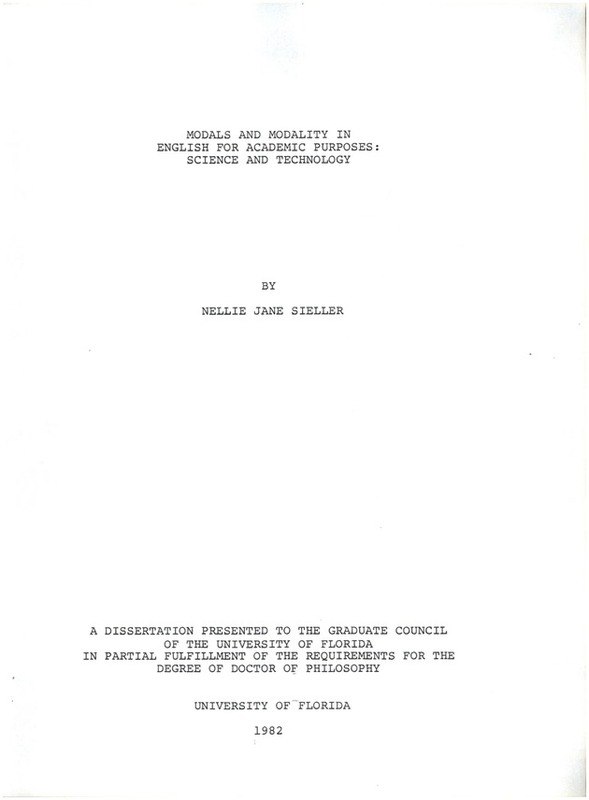 in the United States during the 1980/81 academic year. whether or not EST should be treated as a separate entity. and 4) those which define it in terms of its purpose. intention, the purpose behind their selection and use." chosen for analysis would depend on the researcher's purpose. Definitions of modals tend to be somewhat circular. the only group of words in English which express modality. and expectation ('There is no chance etc. forbid ('He wants etc. me to win'). can, could, a, migt, must and ouqht. Various approaches have been taken in modal studies. semantics, pragmatics, and a syntactic-semantic paradigm. same time during the sixteenth century (110-3). [wu:ld]. .. ." Need is another example of bizarre history. better, as in he better go, in the category with must (409). concerning speech acts, e.g. promising, betting, naming. uttering the sentence--that is its illocutionary force." can, might, and could are considered with this in mind. He goes to London tomorrow. He will go to London tomorrow. diverge in varying structural and semantic ways" (76). The study and findings are summarized in Chapter VII. I work with at Bayamon Technological University College. also provides for distinguishing the different uses. relations are expressed through modals. omnipresent: they are community mores. the actor brings the event to completion. fraction of the total possible reference" (169). signify that the actor is hardly free to desist" (187). English system of modal markers for relative assertion"
auxiliaries . is valid, especially for American English." that would apply to as many occurrences as possible." meaning but which add something of their own" (10). result of the relevant factors. aspect(s) of the state of the world. bases of any study available to date. carried out using the same framework and then compared. are such as to justify characterizing them as 'modality'." (v) No -s form for 3rd person singular. point out some regularities, correspondences, parallelisms"
about the possibility or necessity of propositions. Jim may be at home. Jim may have been at home. The proposition is marked for past through the use of have. that may be associated with change of subject)" (Palmer 1979:34). Jim might be at home. Jim must be at home. Jim must have been at home. Jim needn't be at home. Jim mustn't be at home. necessary-not is logically equivalent to not-possible. Jim may not be at home. Jim can't be at home. John must have seen Mary. Palmer (55) found "no clear examples of epistemic shouldn't,"
is an example with the proposition negated. Jim is bound to be at home. epistemically "refers to what it is reasonable to expect"
"it seems that MUST, NEED, BE BOUND TO can all be used"
modality of an event rather than a proposition. essentially in the giving of permission" (Palmer 1979:59). You may go to the movie. You can go to the movie. Commands, "often of a brusque or somewhat impolite kind,"
No, you may not go to that movie. The event can be negated through stress. I was under the impression that you were going. the movie, if that's what you want. one equally gives permission for the action to be performed"
Yes, you may eat the cake. Yes, the cake may be eaten. MAY and CAN, but they are "more diffident or polite"
neither the modality nor the event for past. I don't promise to write that letter. the deontic modals. "It has no past tense forms. ..
negates the event not the modality; it advises nonaction"
(Palmer 1979:70). It would also seem to be voice neutral. event is possible or necessary. then in terms of their characteristics. uses of BE ABLE TO. He also includes a discussion of DARE. CAN is used "simply to indicate that an event is possible"
implication, that action will, or should, be taken." (viii) BE ABLE TO rarely occurs with passive forms. SHOULD and OUGHT TO, and NEED. "it is not always possible to distinguish between" them. appears only in the spoken texts. tag questions, since there is nothing odd about"
be considered as indicating a conditional necessity. TO can be used. There is no past form of MUST. The neutral dynamic modals are voice-neutral. distinguish these from the other uses of WILL. the modality can be marked for past but not the event. was in she could actually kill. Passivization in this sentence would be quite unusual. modality, existential modality, and nonfactivity. I'm buying an awful lot of books here. GOING TO with BE ABLE TO or HAVE TO. and negation of the event with WILL and BE GOING TO. questions with BE GOING TO are apparently not uncommon. a modal use expressing a rather "remote possibility." a nonmodal present tense form is used." I wouldn't be in too much of a hurry. wouldn't know, I wouldn't mind. keep it for a whole year unless it is recalled. and he refers to them as rational modality. clear that they were in a foreign country. May God bless you all through the coming year. However difficult it may be. ..
all published in 1961 in the United States. (though now being imitated) for the study of other languages." been underlined to facilitate readability. John may want to see Mary. proposition is not voice neutral. will, shalI, can and may, respectively, in indirect speech. implication that the event did, does, or will take place." reading assignments corresponding to the recorded lectures. specified class to be lecture-type. with the exception that M-1 had eighty-five students. collect the data more accurately than would a single player. cassetes for use in the transcription phase of the project. The words were distributed as indicated in Table 3-2.
languages. Explanations and examples are presented. from students are answered as they arise. for E-1.) Student questions are answered as they arise. questions are answered as they arise. superficial structures and muscles of the lower extremity. skeleton is also used during explanations and descriptions. Student questions are answered as they arise. organizing principles of segmental motor control. M-2 written data.) Slides are used throughout the lecture. Student questions are answered at the end of the lecture. deal with feedback searching and document space modification. These sections consist mainly of explanations and examples. with the step-by-step procedures given. instructions and procedures for running an asphalt plant. results are presented and discussed in Chapter IV. considered are those defined by Palmer (see Chapter II). purposes, the contractions have been counted as full forms. the sound [w] tends to disappear in weak syllables, cf. such words as answer, Southward, hap'orth, Greenwich ..
in the written data, in completed structures were found. the use of modals in the spoken and written data. in Tables 4-4 and 4-5.
occurs more often in the written data. to are all more common in the spoken data. more common in the written. are more common in the written data. common in the spoken data. as well as between classes. 1 in spoken E-1, 1 in spoken M-I, and 1 in written C-I. in Table 4-18 and for the written data in 4-19.
to a high in C-I of 33.56. 6.76 to a high of 34.67 in E-2. data and Table 4-22 for the written data. of spoken as opposed to written data. lower than the 16 percent found in Barber's study. percent of the finite verb phrases in four medical texts. other areas (see Table 4-20). for the present study are provided in Table 4-26. 4.16 percent with a range from 0.00 in E-1 to 8.23 in C-I. 58.05 with a range from 40.74 in C-I to 96.42 in M-I. modal verb phrases to be passive in his (written) data. does not seem unusual for written data. with which a foreign student could have been confronted. common in the written EST (58.05 percent). nonexistent in the written data. can be made about modals with two verbs. that attempt to represent them, Palmer's included. paralleling the framework presented in Chapter II. must: The one spoken form is not epistemic. total number of occurrences are epistemic. register for that particular variable. to fire, are sort of self-sustaining. The epistemic possibility judgments, in some cases,. shouldn't've slipped that in on you there. the relationship are also size dependent. minus twenty, which is back here. predict that there would be a size principle. occurrence of ought to in the spoken data. Can I have the projector on, please? and uh I'll describe it now.